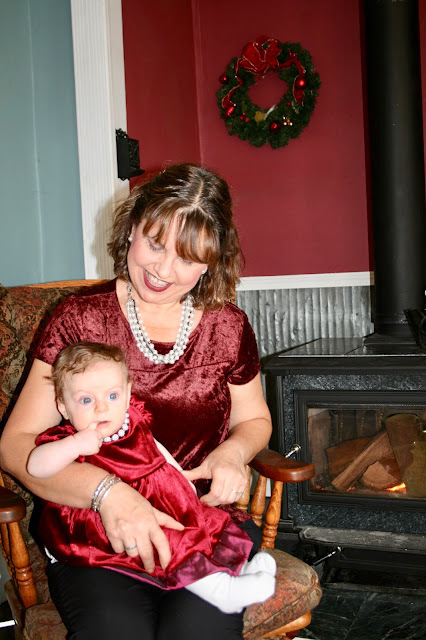 I had my sweet granddaughter Alethea stay in my home for an entire week over Thanksgiving. She did very well, and allowed her mom to get some much needed rest, waking up only once every night. It must have been that fresh country air! 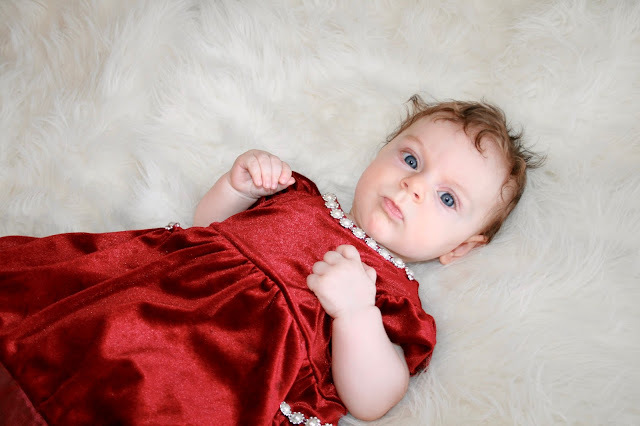 I took advantage of having Alethea home with me to do a holiday fashion shoot. We both wore burgundy velvet, but I must admit, Alethea definitely steals the show in her beautiful dress! 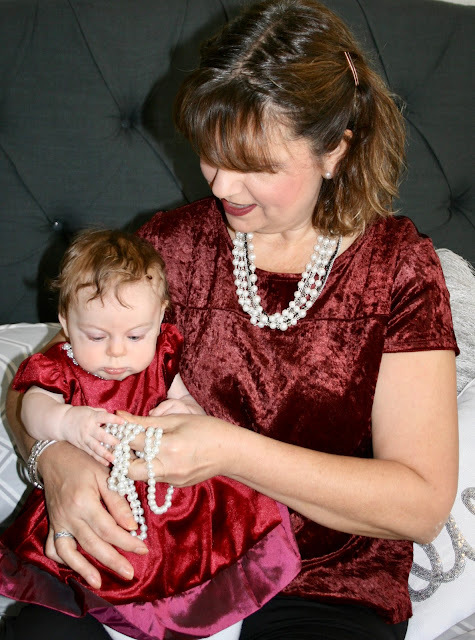 Alethea's dress had gorgeous pearls attached to her dress, so I echoed the pearl theme by wearing a pearl necklace and earrings. 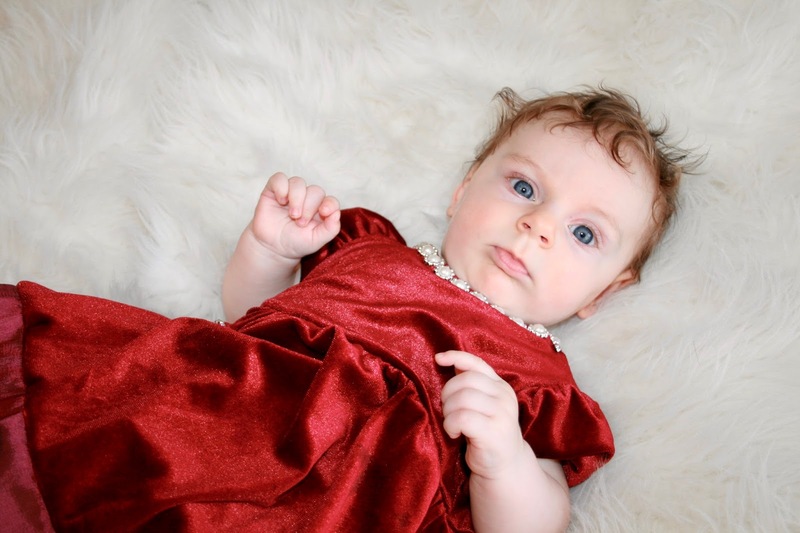 Since Alethea is the star of this post, I will show her pictures first. Isn't she just gorgeous? She is at the age where she smiles and is starting to laugh. I just love this age in babies! I ordered this dress for Alethea from Macy's and I couldn't be more pleased with it. The pearl and silver accents are gorgeous and so elegant. 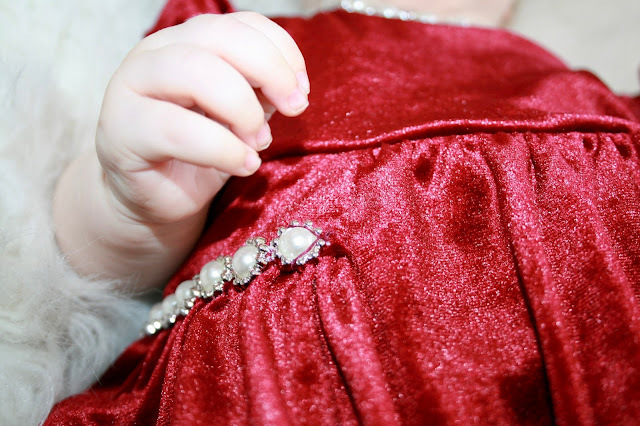 And I love how soft and fluid the velvet is; perfect for a baby! 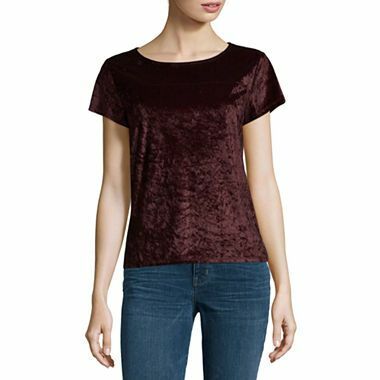 My velvet tee I purchased for $9.00 at JCPenney. 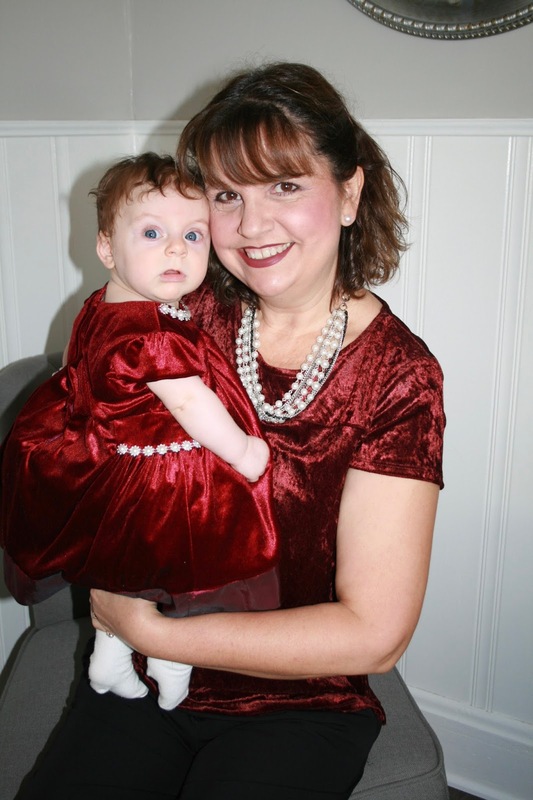 It is the exact same one as the one I wore in THIS POST, except this one is burgundy and not blush. I absolutely loves these tees, they are so comfortable yet classy and elegant at the same time. For my holiday outfit, I chose black dress pants and comfortable black suede wedges. I actually wore this outfit on Thanksgiving Day and even cooked in the kitchen with it (I did put on an apron during the messy parts of cooking). 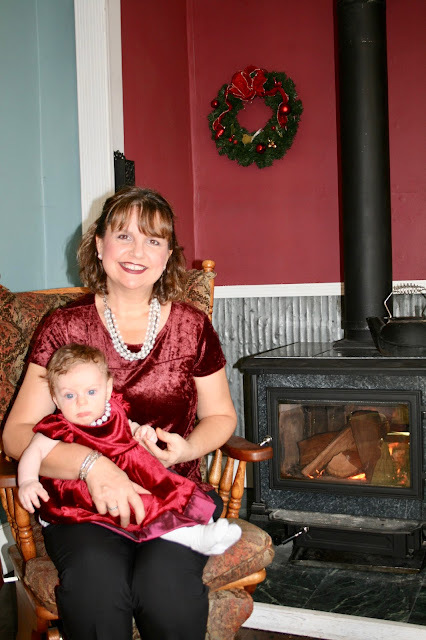 Our house was so hot that day, the weather was unseasonably warm, and we had both the wood stove and oven going all day. At one point the thermostat read in the 80's! The short sleeves definitely helped keep me cool! I will probably wear this outfit again over the Christmas/New Years Holidays. It was so cool and comfortable. 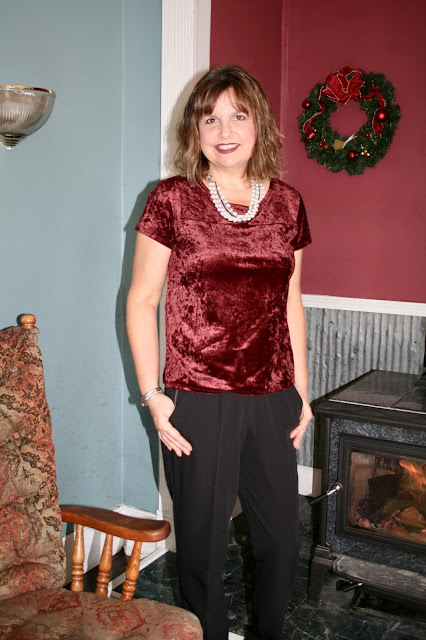 If your the mom or grandma in the family who spends most of the day in the kitchen, yet you want to still look nice, I highly recommend these velvet tees! They come in a variety of colors too! I wore a burgundy lip stain so I could give Alethea kisses all day and not leave lipstick stains on her plump cheeks! :) My pearl earrings are from JCP. The pants are by Worthington (old). They have unique zippered side pockets. 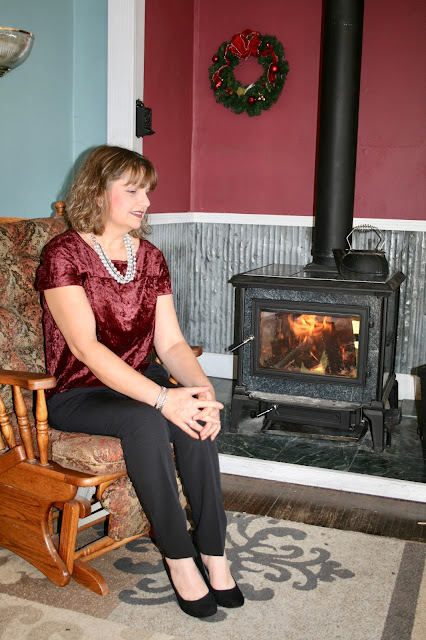 Finally, here are the professional photos of our holiday wear and links to where you can find them. What a lovely pair you are in your velvet pieces!!! Babies are the perfect way to make us smile and realize that this is what life is all about!! Thanks Jodie, yes, they are! You both are too cute! I love your red velvet looks! 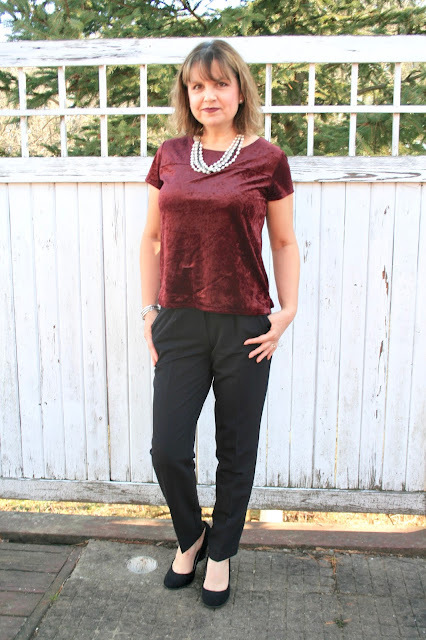 I've been wanting some velvet in my closet! Thanks Laura! 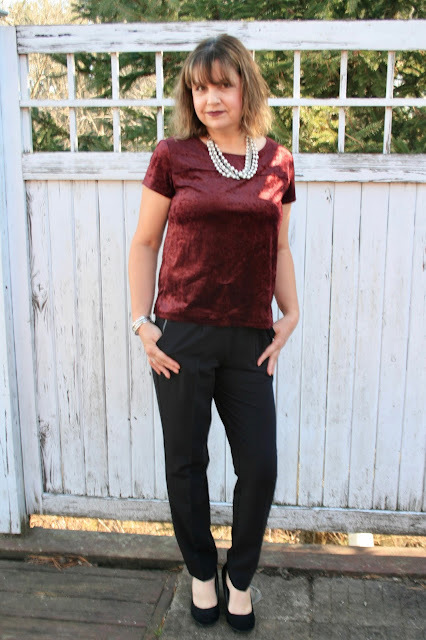 I love the velvet trend! Althea is just beautiful!! 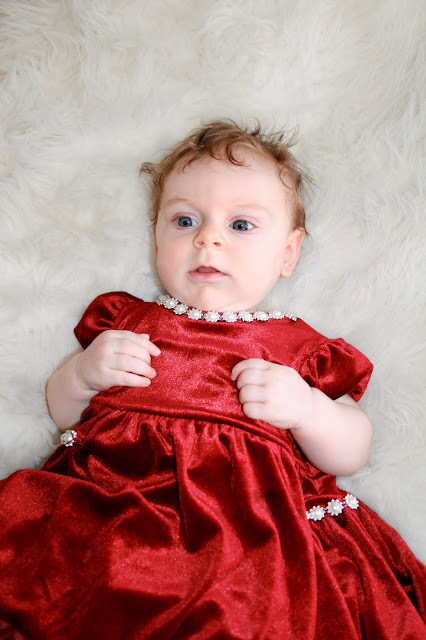 Love your matching looks, burgundy and pearls are so fabulous! She is such a cutie and getting so big! 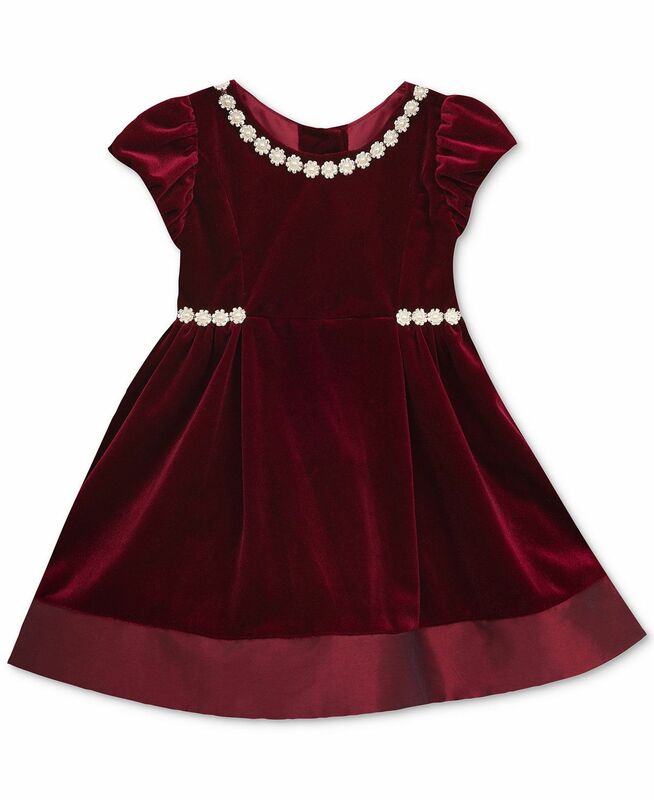 I love velvety dresses for little girls, this one is extra special with the pretty pearl accents. Your outfit is beautiful too, and how fun to coordinate so well! Very pretty looks! Thanks Elli! Yes, Alethea is growing so fast! This is so cute! I am so happy that you were able to spend this valuable time with your family. You and your granddaughter make a perfect pair in those dresses! Thanks for linking up to the Top of the World Style linkup party. You look so cute! Aww, she is just precious, Amy. You both look so pretty in your velvet style. I need to check out those tees, they look so comfortable and cute! Thanks Jennie! They do work perfectly for me, I love that I cook in them! Oh my, don't you two look nice in your matching outfits! 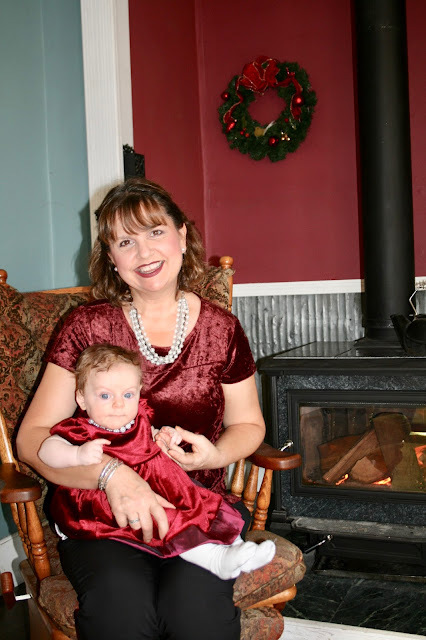 Thank you Amy for linking up at the #BloggingGrandmothersLinkParty #22. I shared your post on G+ and Tw. Thank you Marci! No one has to coax me to smile when I'm holding this cutie! I love this post. 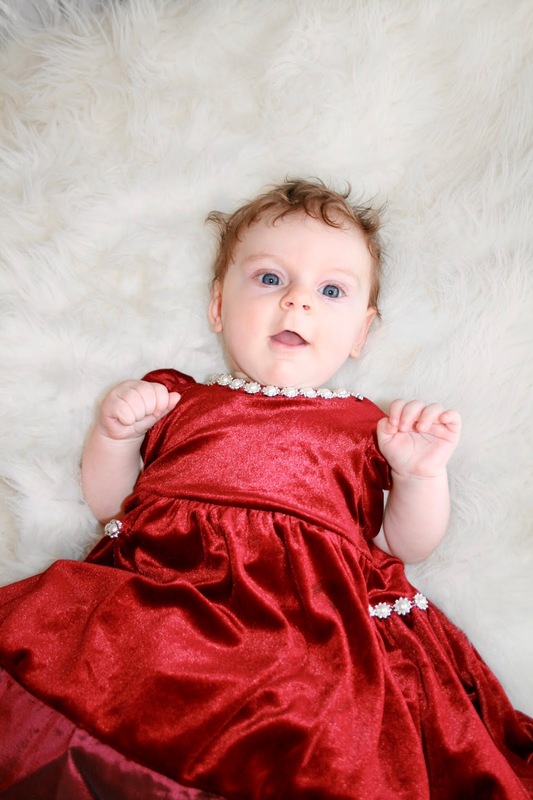 The photos are beautiful and so is your granddaughter. Thanks for sharing on Sunday's Best. How cute! Love the matching outfits! That's a great idea! I will see if one of the "boys" won't mind being our photographer.